MerchantCircle | Blog: Closer Than You Think! As our MerchantCircle membership steadily grows (currently at more than 385,000 merchants), our visitors to MerchantCircle business listings grow as well. Today, we average 5 million unique visitors and nearly 10 million page views a month! 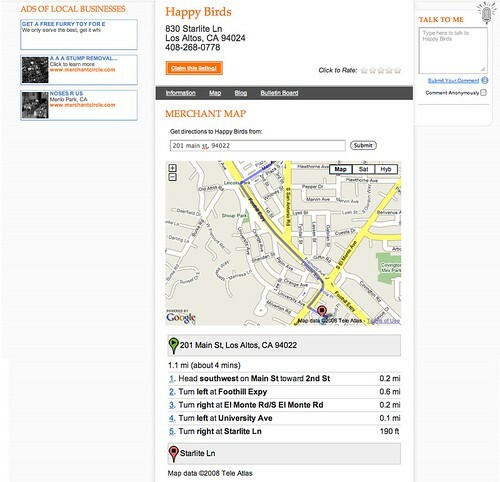 To help our merchants with the added flow of visitors to their pages, we thought it was time to enhance our maps by letting visitors get driving directions from their starting location. Not only can customers get driving directions to their favorite businesses, they can also browse nearby, maybe for after-dinner ice-cream, a movie theater, or a place to stay on vacation. 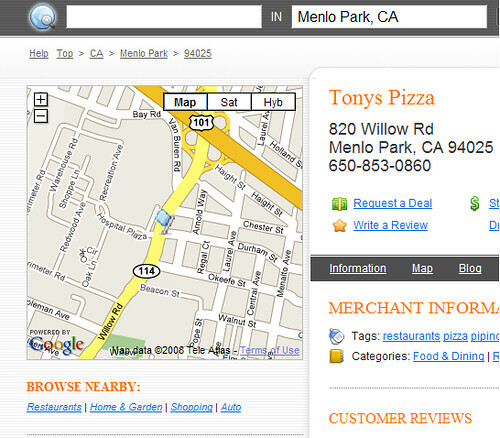 Merchants can also use the feature to meet and greet their business neighbors online, possibly cross-promote and strike up new business partnerships! The possibilities are endless… enjoy.